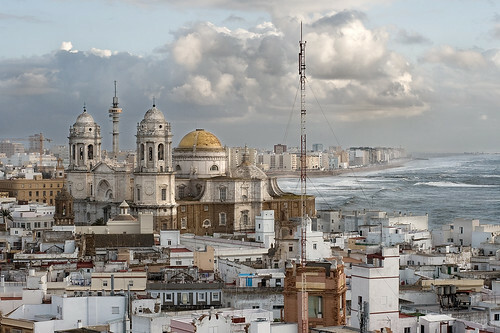 Cadiz is a busy city and port situated on a narrow strip of land in south-western Spain on the Atlantic Ocean. Cadiz is rich in history and one of the oldest permanently settled cities in south-western Europe. Dating back as far as 900 BC it really came into its own as early as the Phoenician era of history. Cadiz is an important shipping port with regular ferry services to the Canary Islands ports of Arrecife in Lanzarote, Las Palmas de Gran Canaria, Santa Cruz de Tenerife and La Palma. The city is also an important port of call for cruise ships which are taking part in a Mediterranean Cruise. Historically Christopher Columbus sailed from the port of Cadiz on his voyages of discovery while during Elizabethan times Sir Frances Drake raided the city and of course the famous battle of Trafalgar took place a few kilometres south of the city and port. 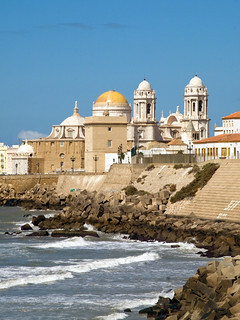 Cadiz is located on the Costa de La Luz which translates as the Coast of Light. The nearest airport to Cadiz is Jerez which is roughly twenty-five miles or forty kilometres away. Gibraltar Airport provides another gateway to Cadiz and is eighty miles or one hundred and twenty kilometres away. Cadiz isn’t your typical beach holiday destination but is a bit of a hidden gem if you want to enjoy beaches, restaurants, nightlife, bars as well as museums. Cadiz has some great beaches which include La Cortadura Beach, La Victoria Beach, La Caleta Beach and Santa Maria Del Mar Beach. The thing to remember when booking vacations to Cadiz is that you cannot expect warm Mediterranean water temperatures as the city is located on the Atlantic Ocean but cooler fresher water temperatures which are just warm enough to enjoy during the hot summer months of July and August. The nearest golf course is the Villa Nueva Golf Resort which is about fifteen minutes away by car from the city centre. One of the must things to do in Cadiz is to try the sherry. Jerez is the major sherry producing area of Spain and is a mere stones throw away. Cadiz is also the place to come and enjoy the colourful carnival in February. Cadiz attractions to enjoy include the Torre Tavira, Gran Teatro Falla, Museum of Cadiz, Oratory of La Santa Cueva, the Montenmedio Golf & Country Club, Cathedral of Cadiz, Oratorio de San Felipe, Neri, Club de Golf Novo Sancti Petri the Barcelo Sancti Petri Spa, La Casa del Obispo, La Cava Taberna Flamenco, the Zoobotanico Jerez, Park Genovez, Museo Historico Municipal, the Palacio del Tiempo, Ingravity and the Elysium Sotogrande Spa. Accommodation wise Cadiz has many fine hotels to choose from as little as €55 a night such as the Hotel Porfirio, Monte Puertatierra, Hotel Argantonio, Parador de Cadiz and the Hotel Spa Cadiz Plaza. Families with children who prefer self catering holidays in apartments and villas will also find accommodation in various price ranges. Of course Cadiz has a whole range of restaurants which have been recommended by visitors to the city such as the Meson Cumbres Mayores, Restaurante Rayuela, Balandro, Vaivai Gastrobar, Taberna El Tio de la Tiza, Restaurante El Faro, Chiringuito Francisco Fontanilla, El Telescopio- La Tabla Restaurante, El Ariate and the Restaurante Abuela Alfrides. Cadiz bars worth visiting are Casa Manteca, Bar Zapata, Woodstock Paseo Maritimo, Nahu, Bar Ultramarinos, El Cañon, Quilla and La Cava. To experience all the nightlife that Caddiz has to offer you should head for El Populo, here you will find a whole host of bars, restaurants, tapas bars and terraces such as the Pay Pay Café Teatro, Los Caños de Mecca and La Hispañola, the Pirate Bar. The gay bar to visit in Cadiz is the El Teniente Seblon. Once a launching point for ships sailing to the New World, this 3,000 year old City of Cadiz is now famous for the Moorish charm of its old central quarter. Its’ name comes from the Arabic ‘Qadis’. This is where the Spanish fleet sailed from before the Battle of Trafalgar. The massive stone walls and forts that can be seen surrounding the old town were built to protect the city after Sir Francis Drake attacked in 1596. I read somewhere that the labyrinthian narrow streets were intentionally designed that way so as to confuse any pirates who dared venture into the city, well, it certainly worked for me! Luckily we found a tourist information centre where we eagerly studied a map of the city which showed four different walking tours each shown by brightly coloured lines painted down the side of the street. The Green route takes you through the oldest neighbourhoods along their narrow cobbled streets. Orange takes you around the former outer defence structures, castles and bastions. Purple allows you to discover the city’s Golden Age when it became the gateway to the flourishing trade with the Indies. Finally, the blue line guides you through historical events which were of huge importance in the history of Spain. As we strolled through the Flea market (Rastro) idly eyeing the goods and admiring the frantic squabbling over prices, we came across the Torre Tavira. During the 18th century many local merchants built towers on top of their buildings so that they could scan the seas and watch the approach of ships from the watchtowers. Torre Tavira is the city’s official watchtower at the top of which is a ‘camera obscura’ which gives a birds’ eye view of the old part of the town. This was an invention of Leonardo da Vinci, a sophisticated system of mirror and optical lenses which projects an image of the whole town into a darkened room onto a white concave screen. The entrance to this is 6 euros, which I suppose is quite cheap. Back outside we repositioned our hats and sunglasses as protection against the fierce sun and marched stoically onwards. We discover the cool shade of Park Genoves which is one of the most beautiful parks in Cadiz and celebrates the discoveries of many of the plants found by Spanish explorers. We marvel at the expertly sculpted trees, spirals, rectangles and ovals being the most interesting. There are lakes, an outdoor cafe and dinosaurs bathing under cooling waterfalls! At the end of the park we found ourselves on La Caleta beach, a glorious panorama of brightly coloured parasols and swimwear. The place was heaving, bustling with children playing, chattering families and of course, those who simply want to stretch out on the warm sand to top up their tan on this wonderful Sunday afternoon. Across the bay, lies the magnificent Cathedral, rising like a phoenix above the haze of the sun, shimmering in its’ very own beauty. Construction of this Cathedral began in 1722. Its architect, Vicente Acero, also worked for five years on the Cathedral of Granada. After Acero, there were five more architects who worked on the building as it took 116 years to finish. We then found ourselves in front of the two largest rubber trees in Europe whereupon we set about arguing whether or not these actually are rubber trees. I am utterly convinced they are but the others tease me, insisting that they must be something more exotic as they bear fruits or nuts which we are crunching underfoot and they have never seen rubber trees as large as these nor have they seen the seeds / nuts / fruit like these bear. Determined to discover what these trees are, I find an internet cafe and soon have my confirmation that these two trees in Alameda de Apodaca are indeed the two largest rubber trees in Europe. Ha! Tired and with aching feet we sought the refuge of a shady cafe where we could relax and chat under the subtle lavender leaves of the Jacaranda, sipping a glass of chilled Sangria. People watching is one of my favourite pastimes and sitting in a shady square with a cool drink has to rate as one of the best places in which to participate in this idle sport. On our way back I find myself having to take a photograph of the Monument to the Constitution of 1812. Other than its sheer magnificence I struggled to find anything of interest about it other than it was created to mark the centenary of the liberal constitution of 1812. On each side are bronze figures representing peace and war and the female figure at the foot of the pilaster represents Spain. The beaches of Cadiz have been used in lieu of Cuba in films such as Die Another Day. A wine merchant from Bristol in England was so intrigued by the fortified wines produced in this area that he mixed four types in 1796 and created what is now known as Harveys Bristol Cream. Jamal, what would you say would be the advantages to living in Cadiz compared to other Costa de la Luz towns? Cadiz, the capital city of the region, has the advantage of being a bustling town with shopping, restaurants and bars within easy reach, historic sites like the millennium old cathedral, and being walking distance to the beach. Having all of the above attractions makes it suitable for all kinds of people and tastes. Aside from the tapas restaurants, sightseeing and beach, there are many trendy bars and clubs that stay open till the wee hours of the morning for those that like to dance and socialize afterwards. Approx. 98 percent of the population is still Spanish. I like to walk around the cobbled streets of the Old town, finding quaint and trendy tapas bars. The indoor food market is full of colour and a buzz that takes you back to the roman era. The Cathedral and botanical gardens are also a must. The indoor market offers stalls with great local and international cuisine. La Taperia in Calle Columela is very nice with a good blend of modern and traditional tapas at very affordable prices. The Balandro restaurant on Calle Alameda Apodaca also offers a great fusion of Spanish and international cuisine with a bar and restaurant menu. Cadiz has a large hospital Puerta del Mar along the main Avenida that runs through the heart of the town, with doctors and dentists both private and public dotted around the town. Shops are available from start to end of the 5km long Avenida that leads you from the entrance of the town to the Old historic quarter, and also within the old town itself. Chiclana de la Frontera is famous on its own, with the world renowned La Barrosa beach as its flagship attraction. Conil, Vejer, Medina-Sidonia are white washed villages that form part of the famous “Pueblos Blancos”. Cadiz has its own University and so does Jerez de la Frontera. However, Jerez has a good international school, offering UK curriculum classes upto 18 years of age. Not really. Thankfully, crime is not a big issue here, as it is in many parts of the Mediterranean coast. Of course, crime exists here, and mostly it is petty or opportunist. So our advice is not to be careless. Keep your possessions with you and lock your cars, house and belongings up when you leave. The property market is starting to move here. There is a lot of interest from European and UK clients wishing to take up low price opportunities. Prices have gone down from 20-50 percent during the crisis, and there are still bargains to be had. However, with the current interest, especially due to previous holiday destinations such as France,Turkey, Egypt etc. in turmoil and uncertainty, many people are turning to Spain as a safe haven, which could drive prices up from 2017. The region of Cadiz differentiates itself from the rest of the costas by not being overrun by urbanisations and high rise developments. There are a few well known urbanisations such as Novo Sancti Petri with its 36-hole competition golf course designed by Severiano Bellesteros. How much are the typical property prices in Cadiz for apartments, villas etc? You can buy a villa in a rural setting for as cheap as 100,000 euros with a 500m2 garden, 3 bedrooms, 2 bathrooms and perhaps a pool. A similar villa in an urban setting will set you back around 180,000 euros and upwards. A 2-bedroom apartment on a golf complex can be purchased from around 100,000 euros, within a 1km of the beach. Any tips and advice to people looking to buy in Cadiz or surrounding area? The rural villas mentioned above have water supply from a well and septic tanks. This water can be used to wash, clean, water the garden, and cook, although we wouldn’t recommend it for drinking. For that you can buy water filters or bottled water from the shops. If you prefer plain water, then you would be better off buying a property in an urban (urbanized) area. We have all kinds of properties to suit all kinds of budgets and tastes. Jamal, thank you so much for taking the time to help our readers with your experiences in Spain. If you want to contact him, you can find his details below. Here is an interesting tourist video on Cadiz.